Wow, that’s a really long name! Probably too long, but when thinking about this recipe it just didn’t feel right to leave any part out of the name. 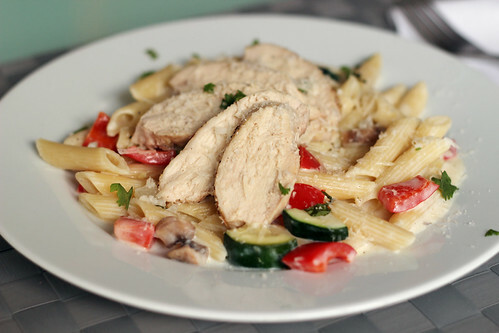 The chicken, vegetables, and roasted garlic sauce all work together to form one beautiful, filling, delicious pasta dish. I knew that I wanted to make pasta for dinner and I knew what ingredients I had on hand, but I didn’t have a specific recipe in mind. So I went searching and what I found was very promising recipe on my friend Krystal’s blog (Krystal just had a baby, by the way!). I worked with what I had and used her recipe as guide, and what I thought was going to be a good dinner turned out to be a GREAT dinner! So much so that I’m putting it back on the menu for this week! The first change I made was to use zucchini instead of broccoli (side note: why can I never spell either of those words right on the first try? mental spelling block) and penne instead of fettucine. I also used milk instead of cream, but because I was worried that it wouldn’t thicken up enough, I added a tablespoon of corn starch. It worked perfectly and even held up and remained creamy for my next day lunch leftovers. Finally, I added mushrooms because it just seemed right. Preheat oven to 375. Cut the top off of a head of garlic to expose the tops of cloves. Place on a sheet of aluminum foil, sprinkle with salt and pepper, and drizzle with olive oil. 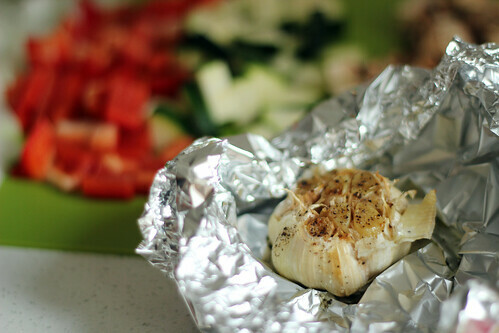 Loosely wrap the aluminum foil around the garlic, pinching the seams to seal. Roast for 45 minutes to an hour, or until the cloves are tender and start to turn golden brown. Allow to cool. Bring a pot of water to a boil. Cook penne until al dente then drain, reserving 1/2 cup of the cooking water. While the pasta is cooking, whisk together the milk and corn starch in a glass measuring cup, set aside. In a large skillet over medium-high heat, heat the olive oil and butter. 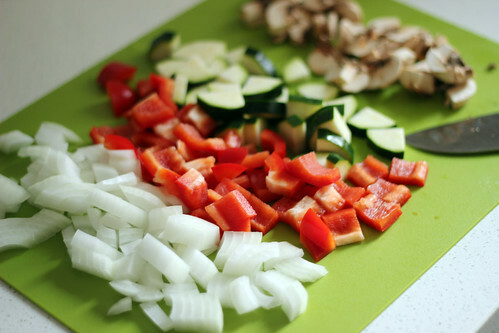 Add the onion, zucchini, bell pepper, and mushrooms. Cook for 4-5 minutes, stirring often, or until the vegetables soften and the onions are translucent. Season with a little salt and pepper. Squeeze the roasted garlic out of the cloves into the skillet. Use a spatula or wooden spoon to break up the garlic and mix into the vegetables. Create a well in the skillet by pushing the vegetables to the edges, slowly stream in the milk/cornstarch mixture, whisking constantly. Work the vegetables into the sauce with the whisk then reduce the heat to low and simmer for 3-5 minutes. Stir in the Parmesan, then cook for another 3-5 minutes, or until the sauce begins to thicken and coat the back of the spoon. Taste and season with additional salt and pepper if necessary. Add the cooked pasta to the skillet and stir to coat. If the sauce seems too thick, add the reserved cooking liquid a tablespoon at time until you get the desired consistency. 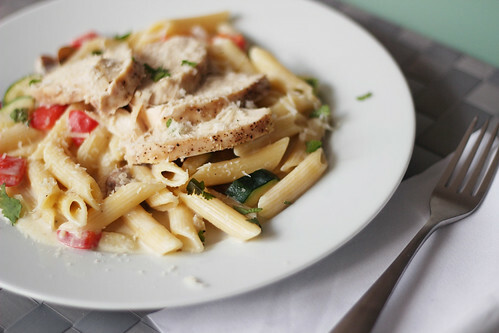 Top each portion with the sliced chicken, extra Parmesan, and fresh chopped basil or parsley. Serve hot and enjoy! >Looks great! I love roasted garlic, especially in a cream sauce! >This looks awesome. I love every component and can't wait to make it! >This immediately went on my meal plan! It looks and sounds so good. I haven't made anything with roasted garlic in a long, long time! >Sounds very tasty! Can I ask what fat content of milk you used? Would 2% or 1% work? >I was in such a pasta mood today and wish I could've made this! Bookmarking for sure. >I'm a little bit embarrassed to admit I'm not even sure what kind of milk I used! The milk fat is listed differently here in China and I haven't quite figured it out! That being said, I am pretty sure it was equivalent to 2%. However, with the cornstarch I included in the recipe, I think 1% would also work. Good luck!